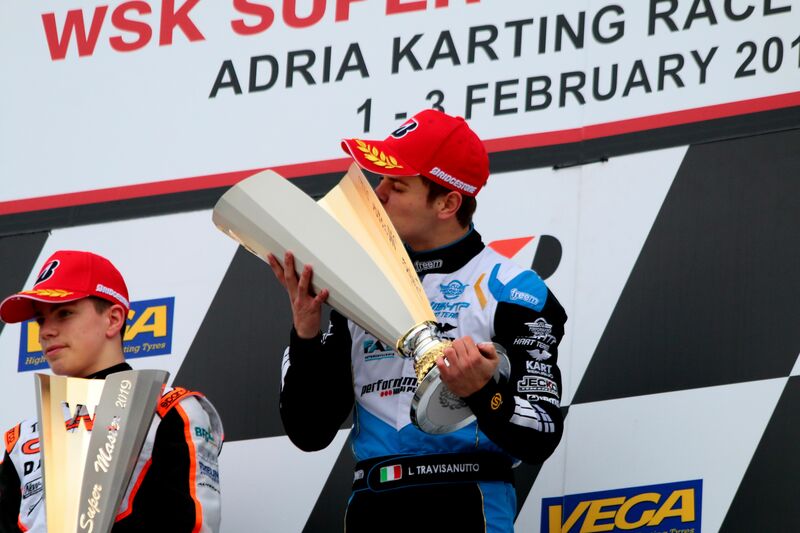 Lorenzo Travisanutto appeared from nowhere to win the first final of the WSK Super Master Series in OK category in the first round of the championship in Adria. The Italian beat Kas Haverkort and Dexter Patterson to climb the top of the podium. As happened with the Mini and OK Junior categories, the qualifiers were passed through water. Fortunately, the rain disappeared at the time of the finals, which could be ran without problems in dry track conditions. In the prefinal A, the Dutch driver Dilan Van T’Hoff (Forza Racing) dominated the race ahead of Dexter Patterson (KR Motorsport) and Gabriele Mini (Parolin Racing Kart). There was also Dutch dominance in the prefinal B. Kas Haverkort (CRG Keijzer Racing) led a great comeback from the ninth position to easily defeat Luca Griggs (Lennox Racing Team), who finished in second place ahead of David Rozenfeld (Kosmic Racing Department). In the final, Kas Haverkort made a very good start from the second position, taking the lead of the race he would keep until lap 7, when Scotsman Dexter Patterson managed to catch him and overcome him. Patterson ran solidly in the lead until world champion Lorenzo Travisanutto appeared from behind to steal the lead from his fellow Kart Republic. Immediately the Italian would escape from Patterson, who was knocked out and was also overtaken by Haverkort. With the victory in the pocket of Travisanutto, the fight focused on the second position in the final laps. A second position that would finally get Harry Thompson (Ricky Flynn Motorsport) after a spectacular comeback of 22 positions. However, the young Red Bull driver would be sanctioned with 5 seconds of penalty after the race for not having the point in correct position, leaving the second position to Haverkort and the third to Patterson.